The protagonist Dr Eric Parrish heads up the psychiatry unit of the local hospital and it’s not unusual for him to be called for a consultation by the Emergency Department when a patient has been brought in, the unusual thing here is that it’s the patient’s grandson that needs Eric’s help. Max is 17 and his grandmother is worried that he will be unable to cope when her times comes, I should add that it’s being hastened by cancer. She fears the worst for Max and wants someone to help him. Eric seeing a soul in need agrees to speak to Max and see what he can do to help the lad out. Max suffers OCD, and seems very well informed from his searches on the Internet what this diagnosis and treatment should be, urging Eric to prescribe him drugs to fix the problem and trying to close down the lines of communication that Eric is trying to open up with Max to get to the route of his issues. Whilst Eric is treating Max privately, he’s running the unit at the hospital and battling his soon to be ex wife over custody and divorce proceedings. Interspersed with the tale of Eric is narration by the “unknown” sociopath in the story, telling how they hide in plain sight, how you never suspect them, the questions used to test the scale of their personality “malfunction”. Never is detail really given as to the identity of the person, mention is given to “keeping him guessing” right after Eric has dealt with someone but the reader is kept in the dark until the end of the book as to who this person is. Events unfold in story that see Eric calling in to question his ethics, his oaths to keep patient confidentiality secret are tested – especially when they could help him or in some cases help the patient. There’s not really much more about the story I can say without massive spoiler alerts, and on the face of it, this is an interesting story so I won’t ruin it for others. The story is interesting, the descriptions are good, you can imagine the settings like the houses of both Eric and his ex wife, the hospital, the characters but where this falls down for me is there just too much to this book. At points it seems that there’s dialogue just for the sake of dialogue – Eric constantly bemoaning that he can’t discuss things because of patient confidentiality…..but at the same time unhappy that he’s being held by the police for things or can’t help his patient when the police are interviewing them because saying something would violate this oath – but he’s happy to carry out his own wee criminal investigations and meddle with things that he really should be steering clear from – just seemed a little unbelievable to me and took up pages in a book that could have been atleast 30 pages shorter. It was a quick paced read, but for me, there was just something missing from the usual standard of Scottoline. Having read previous books of hers I was expecting more. That said, this is still a good read, there’s suspense, mystery, plenty twists and turns that would have Miss Marple out of breath chasing them. The final realisation at the identity of the sociopathic mastermind is good, Eric finally “sees” what he’s been looking at but not seeing, it’s well done but because it took so long to get to that point my attention was waning a little. Glad I finished the book to find out “whodunnit” and who the evil genius was, but I really, really wanted to kick Eric Parrish up the backside at times. I would recommend this to fans of Fiction, Psychological Thrillers, Suspense and Thriller genres, but would add that I felt the blurb on Amazon etc made this book out to be a better read than it actually was, but that’s just my opinion. I would like to thank Headline for the copy of this book in return for an honest review and if you would like to buy a copy, this book was published on 19th November 2015, a copy can be purchased here Every Fifteen Minutes (UK Kindle Version). Dead Ringers by Christopher Golden – author of Snowblind and Tin Men – will thrill fans of Dean Koontz, Peter Straub and Stephen King – and chill them to the bone. Here is a haunted house novel with a deadly new spin. When Tess Devlin bumps into her ex-husband, she’s furious that he seems not to know her. And then Frank Lindbergh is attacked by an intruder in his home … an intruder who wears Frank’s face. But the real terror lies inside the house. Tess and Frank have no choice but to confront a mistake made years ago. A mistake that summoned an ancient evil … and means even their own reflections could kill them. The concept of this was interesting, a doppelgänger is out there somewhere for everyone, it just so happens that this group of people were being “hunted” by theirs in some cases so that the doppelgänger could take over their life. Initially, the book started well, I was interested and hooked. What was going on, someone breaks into the house, has Frank’s face, but it can’t be Frank because he’s attacking Frank…..whoa! What’s going on?! Slowly it transpires that events from the past are coming back to haunt these people, and they need to fight back to try and stop it from happening. From here I lost interest, the characters weren’t engaging and if I’m honest I really wouldn’t have been bothered if the double had taken over and snuffed out the life of the “real” person or if they all disappeared. The descriptions were dull, no feel for the characters or settings, it’s apparently set in Boston but really it could have been anywhere – I really didn’t get a good feel of any location with this book. The characters just didn’t seem to “work” for me, they all had too much of a personal tragedy going in that it felt like hard work keeping up with them. I admit it adds diversity but, in this case it added to the torturous drudgery of reading on. I didn’t feel the suspense that some readers have mentioned, for me this was a book I was determined to finish just to see what happened at the end and see how the author tied it all up. Appreciate that others might have felt this was a scary, spooky hit, but for me it was a massive let down. I wouldn’t really recommend this book unless to someone who was a fan of Christopher Golden’s work, or possibly a fan on Dean Koontz or Stephen King. Copy kindly supplied by Carina UK in return for an honest review. Hannah’s holidays are normally spent nibbling chocolate coins with her daughter and arguing with her sister about whether they’re too old for stockings on Christmas morning. But this year, she’s been offered the dressmaker’s job of a lifetime: creating a one-of-a-kind a dress for her school friend Annie’s Christmas wedding on the picture-perfect Cherry Pie Island. 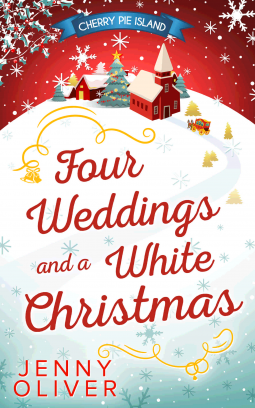 Many mince pies and one hot-pink organza dress later, Hannah is set to snuggle back into her old routine…until she discovers that there are three more weddings this winter – and not a dress in sight! Four very different themes, four demanding brides and four parties spent avoiding chef Harry Fontaine, whose cynicism is as much a wedding day guarantee as confetti and cake. Hannah has her work cut out for her! Yet, with a sprinkling of snowflakes and Christmas magic, it could be that this is the year when miracles really do happen…if Hannah will let them. Having not realised this was actually the final book of the Cherry Pie Island series, I started reading and instantly connected with the characters and their tales, there’s enough detail given to understand who’s who and who they are marrying etc. That said, I would like to point out at this stage, this is a really good book, and the story reads perfectly well as a standalone book. Hannah is a lovely character, she’s just finished her degree and making her way in the world of fashion, her mum proudly showing off a picture of her degree show dress lands her with a commission that opens the door of a world she’d never imagined. After making the wedding dress for her old school friend Annie, there is great interest in her work, and she finds friendships she’d thought she’d lost by becoming a mother. Being invited to so many weddings with the same group of people Hannah is secretly pleased to see that the dishy Harry Fontaine is there. Harry runs a restaurant in New York and is rumoured to be very demanding and ruthless, so much so he will throw out diners for not showing the appropriate decorum whilst in his establishment. He’s also a cynic about family, marriage and love, something Hannah just can’t fathom. As the pair get to know each other through these chance encounters they both realise there’s a connection there, a pull that draws them together. Especially at one of the weddings where Harry is cooking the feast with the help of Hannah’s five year old daughter Jemima. There is also a nice bit about Harry’s back story, his time with his family explains a lot about why he’s so set in his ways and thinks like he does. It really gives a good incite into this complex character. Ultimately, it’s this connection to his family that brings about the change of heart that he has. Without ruining the book for others I won’t say any more about the plot, but there is a lovely feel to this book, you keep reading to find out what happens to the characters, see what wonderful creations Hannah can come up with next and see how much Hannah’s daughter can make you smile and chuckle. As for characters, Hannah is so likeable, Harry has his own rugged, grumpy charms, but for me Jemima steals the show! She’s just what a five year old should be, funny, clever, and throw in her unerring five year old thinking, well you just can’t help but smile at the things she says. She really is one of my favourite characters in a book of late. The writing style of Oliver’s is great, the pace is steady and flows well, the dialogue is natural and engaging, physical descriptions are wonderful, there aren’t many times that I wish a book had images to go along with the texts, but it would have been wonderful to have seen images of Hannah’s creations, just picturing them in my head had me in awe. This is definitely a lovely book to curl up with for Christmas, it’s a genuinely enjoyable read. I would have no hesitation to recommend this to anyone that enjoys Fiction, Romance and Comedy genres. 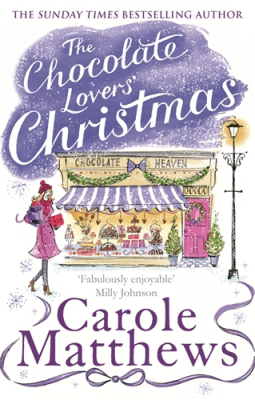 Having not realised this was actually book three of the Chocolate Lovers’ Club, I started reading and instantly felt immersed in the chocolatey world of Carole Matthews but did wonder about some passing references to previous events (usually about something that Lucy had got up to). That said, I would like to point out at this stage, this is a really good book, and the story reads perfectly well as a standalone book. Lucy is running Chocolate Heaven, a cafe which sells chocolatey wonders of all sorts, so much chocolate that part of her job is to eat the chocolate (as much as she wants!) to allow her to enthusiastically recommend it to the customers (I know, it sounds hellish doesn’t it?! Find me a real Chocolate Heaven and put my name down!!) But despite landing her ideal job, Lucy is running herself ragged, she barely has enough hours in the day to run the business, take care of the paperwork after hours and spend time with the love of her life Aiden aka Crush. Nadia is struggling with life after her husband’s death, she’s bringing up Lewis on her own, job hunting and guarding her heart from future hurt. Chantal has the delightful baby Lana to look after, a far cry from her life as a powerful business woman, gone are the manicures and suits, and instead she’s wearing comfortable elasticated waistband trousers and trimming her fringe herself. She’s trying to keep her marriage to Ted alive, but things just don’t seem to be going as well as they could, but it might have something to do with the baby Ted fathered round the same time Lana was born? Autumn, struggling with her grief at the death of her brother, can’t find the support she needs from her fiancee, it’s a source of argument for them and she’s miserable in her relationship. But for these women, there’s two things that can help them, one is chocolate and the other is The Chocolate Lovers’ Club. As the girls meet up for their regular catch ups in Chocolate Heaven, their stories come out and interweave, Nadia has another interview, Autumn offers to look after Lewis. Lucy’s ex fiancee turns up out of the blue, Chantal worries that Ted isn’t over the mother of his other child, Autumn worries that she no longer loves Addison and Lucy worries that Aiden will leave her because he never sees her. And like all good friends, they share their worries over chocolate and hatch a plan to fix things. Each chapter alternates between the ladies, allowing the reader a glimpse into thoughts and emotions at what’s happening, the grief that Autumn struggles with is very well written, you can’t help but feel for her loss and despair. The pace is good, there are no slow points or any bits you want to skim over. Physical descriptions are fantastic, you get a very clear image of all the characters as well as the tantalisingly delicious sounding chocolate brownies, cakes and chocolate in general (I hope there is a recipe book in the pipeline! ), even the antics that Lucy and the girls get up to are so well described you feel part of the gang and can snigger at the situations they find themselves in. When her long-term relationship with Seth takes a turn for the worse Claudia fears that this is it, she will be alone forever more, life is over and she’s going to be miserable until the bitter end. Her best friends Nick and Penny are there to help her pick up the pieces and put her life back together again. And once she feels ready, Penny knows just what Claudia needs to make her feel better, a date! Blinds dates aside, Claudia is worried she’s not ready yet, not ready to move on, not ready to decide what she wants from life, what she wants to do or who she wants to be with….or does she? Claudia realises that if she wants something she needs to stand up and take the opportunity. She makes the decision to go on dates, some are disastrous, some are wonderful (especially when a certain man is concerned) and one brings a new friend into her life. But there’s one man that keeps appearing and she definitely wants to spend more time with him. 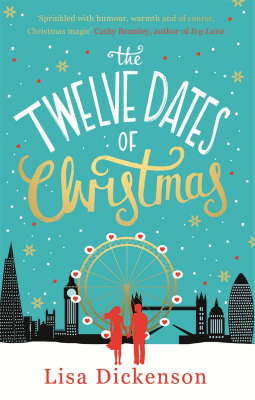 The dates themselves range from a trip to the Winter Wonderland, to coffee in Starbucks, or ice skating ending in trouble with the Police, but all have their equally funny moments for Claudia. As the story progresses Claudia becomes more and more adventurous, she finally admits her feelings and for a fleeting moment she finds happiness, but will a silly understanding ruin it all? I can’t say more about the plot without giving too many juicy bits away, but I will say this, sequins on knickers sounds painful!! I love Dickenson’s writing in this book, there were times I genuinely giggled out loud or wanted to shout “nooooooo! !”, I felt like I was right there with Claudia at times, seeing the excitement on Nick and Penny’s faces when they were speaking about Christmas or when they were all drunkly dancing at the Ballet Christmas party. The descriptive writing here is tremendous, there’s great attention to detail and the characters are all so likeable. This is definitely a lovely book to curl up with for Christmas, the sort of book you could easily read in a day if you got the peace and quiet to do so and it’s a genuinely lovely read. Copy kindly supplied by Fahrenheit Press in return for an honest review. Things could scarcely get worse for Raef Carlton – his marriage is on the rocks and his family-owned merchant bank is threatened by a hostile takeover. But then Daniel Stewart, Raef’s closest friend and Carlton’s treasurer is found shot dead at point-blank range and Raef’s life really plunges into free fall. Merchant Banking is never without risk, daring or intensity, but for Carlton Brothers, the risk and intensity is all too real. Arriving at work after the Christmas party, Raef Carlton doesn’t realise that business is about change forever. Daniel, his closest friend and bank treasurer won’t be coming to work today, or ever again, he’s been shot dead at point blank range and the police want answers. As Inspector Ryan delves into Daniel’s private and professional life things are uncovered that Raef is uncomfortable with. Why did Daniel die that way, what was he up to that would result in him being shot? Could it have been someone from the bank? Just when Raef thought it couldn’t get any worse, there is word of scandal afoot in the bank, fraud is taking place and it will bring Carlton Brothers to the very point of collapse. Raef struggles to wade through the trades, deals and markets to find out who could be behind this all, to see if Daniel was involved all whilst trying to continue with running the bank and dealing with a personal life that lies in tatters, his marriage is dissolving fast, he realises all too late that by building up the bank he’s pushed his wife and family to the side and has neglected them. As the pace builds to the big reveal of “whodunnit” you really find yourself hooked, you want to know what happened to Daniel and why, but more importantly, what’s going to happen to Raef and the bank. To quote Shakespeare, “Something is rotten in the state of Denmark”, but just how deep does the rot go? With twists and turns aplenty, it’s difficult to guess who is the most manipulative character, who the murderer is or even how it will end up, but one thing’s for sure you will struggle to put this down! 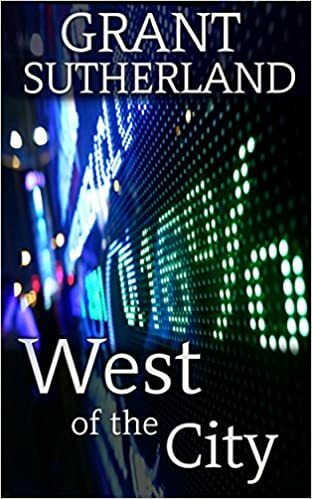 Sutherland’s time as a stockbroker shows with the in-depth detail of market trading that takes place in this story, but there is enough information there that it is easy to pick up what’s going on. For someone with no experience of the financial intricacies of this story I managed to keep up with the trades and deals without feeling too lost. The writing shows great skill, there’s a depth to this you just can’t find in a lot of books, definitely a feel of a Le Carré or Jeffrey Archer book, the ability to layer mystery, intrigue and brilliance makes this stand up next to the works of these great authors and could easily be classed as a “good old fashioned thriller”. I would recommend this to anyone that enjoys Fiction, Financial Thrillers, Crime and Mystery Genres. 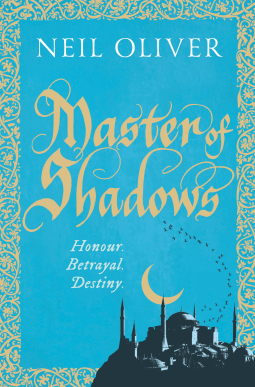 Copy kindly supplied by Bookouture in return for an honest review. Libby Joseph is famous for her romantic Christmas stories. Libby and George are instantly likeable characters, Libby is cool, calm and level headed (most of the time), George is funny, silly and Christmas crazy but they go together like Port and Stilton. They’re perfect for each other, they just don’t know it yet! As the story progresses, we Libby’s story comes out, the heartache at watching her mother wither in a loveless marriage, seeing the mental abuse her mother faced, the live she and her mother lived at the hands of her stepfather and how Libby came to make her escape, and more importantly why she felt she could never settle in one place. A cleverly written novel, with narration from both Libby and George, gives an insight into what both of the main characters are thinking. It is especially good when it comes to explaining the thinking behind each character, especially when it comes to the sub plot of Seb and his love interests, and his relationship with his mother in law. The pace of the novel is good, short chapters allow you to quickly move through the story, the dialogue is interesting, funny and entertaining. 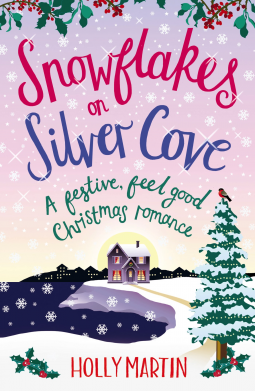 I love how this and Christmas at Lilac Cottage link together, but you don’t need to have read the first one to know what’s going on in this book, they run at the same time but there is little character crossover, which just makes Silver Cove sound like such a lovely place to live with such lovely people. The descriptions of characters are well thought out and give the reader a feel of just how funny George can be dancing around with a giant Christmas inflatable, or how incredibly wrong Judith was about Amy buy misinterpreting everything. I particularly liked Martin’s writing style when it came to several points in the novel where I laughed out loud, or sat smirking away at the dialogue. The wonderful romantic settings created were fairytale-esque, but not over the top, making the reader realise that maybe there’s a “George” in their life for them to appreciate. 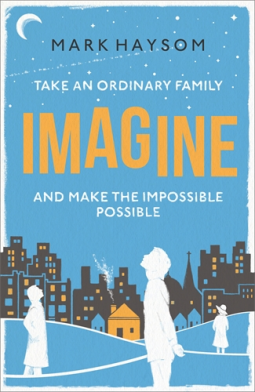 This is definitely a lovely book to curl up with for Christmas, the sort of book you could easily read in a day if you got the peace and quiet to do so and it’s a genuinely heart warming read. Baxter – the first Bird to go to university. It’s fresher’s week and a new beginning. Except that his troubled past has followed him right into the lecture hall. Christie – haunted by what’s gone before and held back by heartbreak. But with her son succeeding against the odds perhaps now it’s her turn to follow her dreams? Truman – an absent father and husband for ten years, he now decides he’s owed a second chance. And to help him on his way he’s found a golden key that will open every door. Or so he believes. The Bird family are a “normal” family in the sense that there’s things they don’t talk about, Truman Bird being one of those things. So when Christie takes her children and turns up on Nanna Bird’s doorstep, a complete stranger who also happens to be her mother in law, she’s truly desperate for help. Nanna Bird takes them in, realising what a tangle her son has made for this woman and three children and together they muddle along, never thinking too much about Truman. When Baxter is offered a place at university Christie is so proud of her little boy, this is his time to shine, he’s survived the struggles of the past 10 years, every penny Christie scrimped and saved to give her kids the best has paid off, that is until Truman decides that his luck has run out and he makes his way back to the not so loving embrace of his family to see what he can scam out of them… things are about to change again for the Bird family. I don’t want to say much more, I don’t want to give away any spoilers, but suffice to say I thoroughly enjoyed this one! Haysom demonstrates great skill in his writing setting this in the 1970s, you really get a feel for what life was like at that time (yes I know that sounds very clichéd, but hey I was born in the 1980s). The characters are fantastic, Christie is a superb character, showing great growth and depth as the story progresses, Baxter struggling with the complications of growing up and wanting independence shows is also a great character. Being able to create Truman as such a despicable character is a sign of good writing, for the author to invent such a character and keep him as awful as Truman makes this a great read. For the reader, you want to keep reading to see what new lows Truman can sink to, you want to see if he gets his comeuppance. Having not realised that there was a book preceding this (Love, Love Me Do (UK Kindle Version)), I can honestly say that this book was a great standalone, I didn’t feel that I was missing any information or enjoyment from this story but I will be making a point of buying a copy of Love, Love Me Do just to find out what happened before and see what I missed. This was an incredibly well written book, perceptive, well thought out, and interesting. The characters were engaging, credible and on the most likeable (expect Truman….ooh I didn’t like him! ), there are some genuinely sad moments in this book but there are also some fantastic moments you laugh out loud or smile and nod knowingly, it’s an all round good book! I would have no hesitation recommending this book to fans of Contemporary Fiction.